Excise taxes are probably the least-fun part of the beer industry, but they are important for brewers. House Bill 151, introduced by Representative Nordgren and awaiting a hearing in the House Economic Development and Tourism Committee, would solve a major issue with the ABC beer excise tax when applied to brewery tasting rooms. What is the ABC Beer Excise Tax in Alabama? Every manufacturer licensee shall file the tax returns, pay the taxes, and perform all obligations imposed on wholesalers at the times and places set forth therein. So why does the brewery pay more? 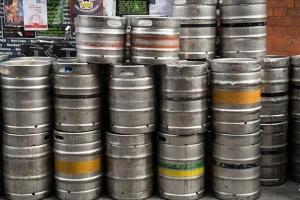 The Alabama Alcoholic Beverage Control Board has decided to impose the tax on the pint instead of the keg. Because of the way the state beer excise tax rounds up, brewers pay $0.10 per 16 fl. oz pint instead of the $0.05 per 12 fl. oz imposed by § 28-3-184. To be clear, we do not believe the ABC is acting illegally or maliciously. The way the original Brewery Modernization Act was written in 2011 is vague and subject to some interpretation. However, we also believe the legislature clearly intended for brewery tasting rooms to pay the same rate as wholesalers. This simple sentence makes it clear that the beer tax is assessed the same way for both brewers and wholesalers. The current system requires brewers to report each serving to the ABC in monthly reports. This process is time-consuming and error-prone for the brewery. For the ABC, tracking and verifying thousands of individual consumer transactions each month is an impossible task. The ABC has no way of accounting for spillage, whether the beer goes down the drain or is left un-served in the keg. There is also no good way to account for small variations in pint sizes – some beers have more foam than others. The new system would make reporting much simpler for the brewery while also making them more accountable to the ABC Board. The full excise tax required by statute would be paid up-front on the entire keg, and any spillage is already tax-paid beer.